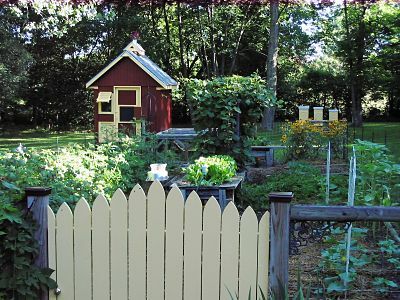 Richard’s Coop de Hill sits behind his vegetable garden, near his bee hives. 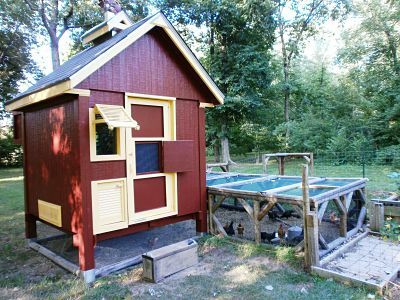 If you want a chicken coop that sits in one place like Grandma’s did (as opposed to the movable coop in my last post), you might be interested in this picturesque coop built by Chicago’s Mindful Metropolis Publisher Richard McGinnis for the backyard layers at his rural farm Thorny Hill Manor, from which he works or commutes into the city by rail. The coop is 6’ wide x 8’ deep – the walls are just over 6’, it is 10’ at the peak and it is raised 20” off the ground. It has four levels. 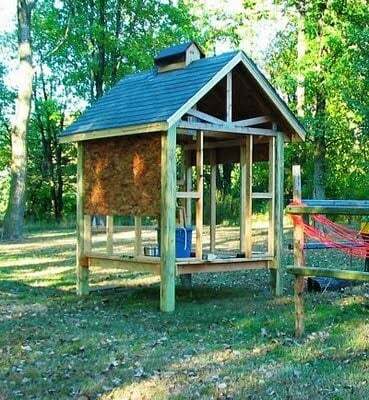 The fenced in part under the coop where the hatch and ramp are is also 6’ X 8’ and opens out into a 7’ x 12’ outdoor covered run. The interior of the coop has a main floor that is 6’ x 6’, a common nest box that is about 1’ deep and 6’ long with outside access, two additional hanging nest boxes on the wall, a roost above the common nest box (with an outside door for easy cleaning of the roost pan) and a large storage loft for feed and bedding, etc. 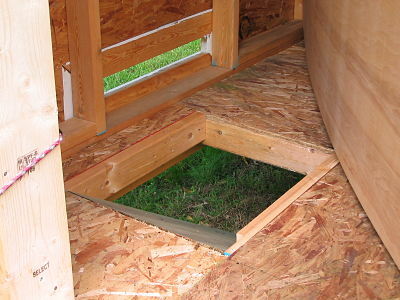 that allows the chickens to come and go through a hole in the floor. and the top ones open to a storage area. One of the things I especially love about Richard’s coop is that more than half of the building materials were recycled or repurposed — and it is so cute, which proves that we can be fashionable and green at the same time. Unlike most coops that have chickens coming and going through a door in a wall, this one has the chicken door in the floor! Does this coop move? Heck anyone who lived in rural America could do this. 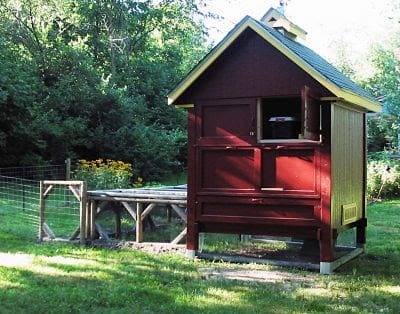 This particular coop is not movable. However, if you put it on skids, you could move it with a front loader, tractor, or pickup.